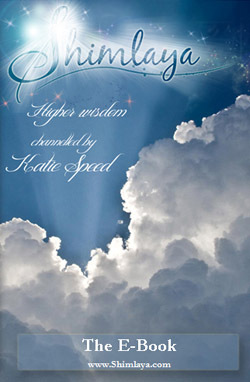 Welcome to the website of angel channel, Katie Speed, and one of the greatest loves of her life, angel Shimlaya. Read more about Shimlaya and how Katie started working with her. Shimlaya is a beautiful angel from the realms of love, and her purpose is to help bring more love to the planet and remind us of who we really are. She speaks through Katie to offer new depths of love, insight and support into our lives, she does this in a variety of ways – through personal channelled readings, where you have the opportunity to have a one to one conversation with her. They are also regular contributors to the free on-line magazine Inspired World where you can read her channelled messages and group meetings in different parts of the UK. They will also be appearing live at events internationally to share Shimlaya’s wisdom and answer questions from the audience. It’s a huge part of Katie’s purpose to share Shimlaya with the world, and we’re so glad you found us.